Lily Hayes imagines her semester abroad in Buenos Aires will keep her constantly surrounded by exotic language, food, men and stories. Instead, she finds herself living with a distrusting local family and boring American roommate. Eyes focus on Lily when her roommate Katy is found brutally murdered early into their stay, with tell-tale e-mails, witnesses, and DNA all building a seemingly open and shut case. Though the story seems to share roots with the Amanda Knox case, Lily’s tale branches off in several unexpected directions. 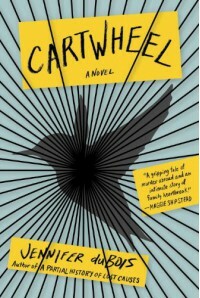 Cartwheel is much more than an echo of tales already told. duBois uses each of her characters, particularly Lily's father Andrew, to raise questions about parenthood, marriage, culture and justice in honest, insightful prose. In this follow up to her widely hailed debut novel, Jennifer duBois guides readers along the line between belief and doubt, showing that it often blurs far beyond what we’re capable of seeing ourselves.